Welcome to the nursery! It’s a funny thing how life changes can change, well just about everything! When we bought this house a year and a half ago, we definitely had babies on the brain, but we surely didn’t expect it to happen so quickly. 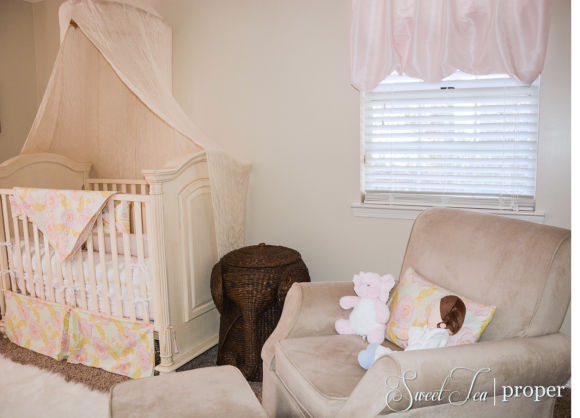 Between nursing sessions, diaper changes, and playtime, the nursery has become one of the most used rooms of the house. During the start of the renovations, we picked out the room closest to the master bedroom to be the future nursery. At this point we still didn’t know if we were having a girl or a boy so we painted the room a light beige and planned on giving it color with bedding and decor. The first nursery that I fell in love with was in the movie Father of the Bride 2. It is magical, huge, and way out of our budget. 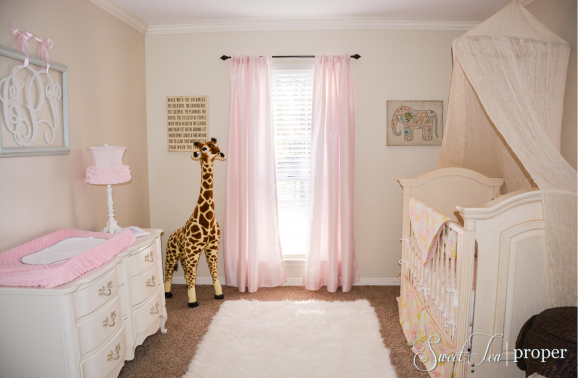 However, although our nursery is about a third of the size of the nursery in that movie, one thing that both nurseries share is a giant stuffed giraffe. Whether we were having a boy or a girl, I knew I wanted one. We purchased the Melissa and Doug Plush Giraffe through Amazon.com. It was the cheapest I was able to find it and had free shipping. Once the basics were taken care of, we started searching for furniture. We were given a beautiful crib from Mr. P’s brother and sister-in-law. We found a French provincial dresser on Craigslist for $40. With a little bit of love and two coats of paint, it made for the perfect changing table. Finally, we finished off the furniture with the Kelcie Swivel Glider and Ottoman in beige from Walmart.com. I’ll be honest, I was a little hesitant about purchasing furniture from Wal-Mart. This same glider was also listed on their sister website Wayfair.com with only average reviews, but it was the cheapest one for the look I wanted. Quality is probably not the first word that comes to mind when you think of purchasing furniture from Wal-Mart. Four months of use and this glider has been perfect so far. It’s a good neutral color and is very comfy which is the biggest plus since I’m usually in it during the wee hours of the night. I fell in love with the Indian Cotton Guaza Bed Canopy from World Market. When I went to purchase it online, they were sold out (as of this righting, they are back in stock!). I called my local World Market and they had one left in stock. It was fate. Once we had the giraffe in place and canopy over the crib, our enchanted jungle theme started to take shape. The beautiful wicker elephant-shaped hamper was purchased on homedecorators.com. We purchased it in the dark brown and are using it as a toy bin. It also comes in a light tan and white. Since it was more expensive than we wanted to pay for a toy bin, I waited until it went on sale to purchase it. Home Decorators always has great sales so if you don’t need something right away, wait it out and the item that you are looking for is bound to be discounted at some point. Another item that we purchased from homedecorators.com was the white faux sheepskin rug. Originally, I wanted the rug to have a more unique shape to it, but the price of the rectangular one was substantially less. This rug is very soft, does shed quite a bit so I would recommend vacuuming it several times before use. My nieces and nephews love to lay on it and make “snow” angels. Mr. P had given me this inspirational quote artwork as a present. I just love what it says and I hope our sweet baby finds it inspiring as she gets older. The other picture in the room is a colorful painted elephant. It was purchased at our local Hobby Lobby. This is another store that is known for great sales. We picked up this picture at half off. 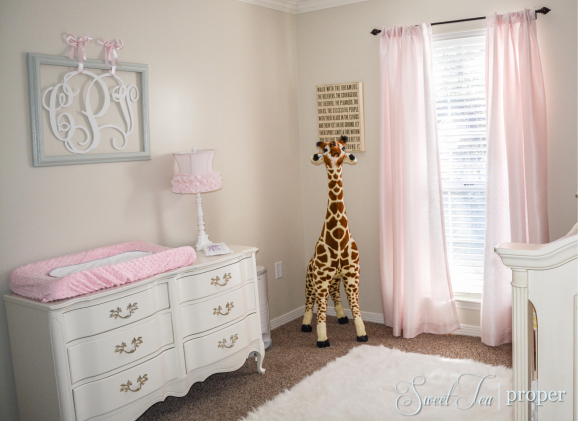 Above the changing table is a framed large letter monogram. The wood versions of these are pretty pricey so we made our own with foam. You can check out the tutorial here to make your own! The adorable pink and white tutu lamp was picked up from Kirklands, but sadly I don’t think they are for sale anymore. Usually, our changing table also holds our wipe warmer and hand sanitizer, but I removed these for the pictures. You’d be surprised how much you can fit onto such a small changing table. On the other side of the nursery we have two decorative wood pieces. One is a rustic picture frame. I had an extra wooden “C” on hand from our burlap and lace baby shower and hot glued it to it for extra color. The other item is a wooden monogrammed hair bow holder. I made one for Cecilia and one for a friend. This is an easy DIY project. You can find the tutorial for it here. To give the room a sweet girly feel, I found these great curtains from the Shabby Chic collection at Target. The pink is soft and lovely. Although it doesn’t say it on the packaging or on the website, the balloon window shade and the panels are made from the same material. Since we have one small window and one large window, this worked out perfectly. Crib bedding can be very expensive. Since pediatricians only recommend a fitted sheet for the first year, we didn’t want to invest too much in the bedding. We purchased three sets of pink and white sheets from Target and were given the beautiful bumper (although we don’t use it on a daily basis). I purchased this beautiful fabric called Amy Butler Midwest Modern and made a blanket and pillow cover with it. To finish off the blanket, I had it monogrammed with a large “C”. This room wound up being one of the easiest and less expensive rooms to transform. Now that it’s complete, we can spend more time enjoying our little one and less time working on the house.